FULTON – Lanigan Eagles soared to new heights during the elementary school’s recent Battle of the Books competition. 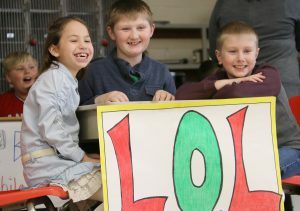 Students, from left: Olivia Hendrickson, Brady Wagner and Owen Tice share their excitement of reading during the school’s recent Battle of the Books competition. “Some Random Team” members Trevor Hendrickson, Harper McClave and Megan Ackers received a perfect score of 128 to earn first place in Lanigan Elementary’s Level 2 battle. “MMC Hammer” team members Matthew Brown, Meghan Galvin and Charlie Chen received 104 points to earn second place. Both teams advanced to the Fulton City School District Battle of the Books competition. 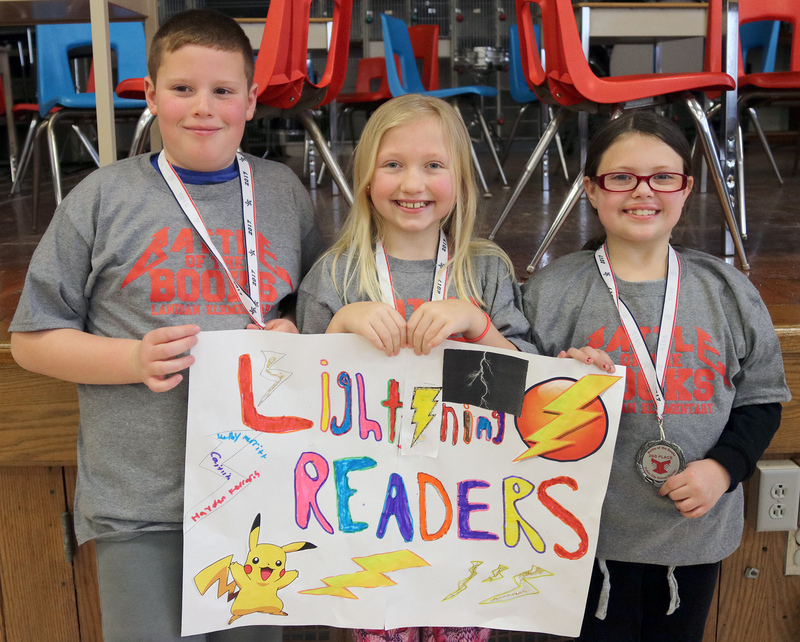 “Lightning Readers” team members Hayden Ferraris, Shelby Merritt and Caitlin Scout show off their medals after receiving second place in the Lanigan Elementary Battle of the Books competition. Leading up to the event, students studied 10 books in addition to their regular school work. During the Battle of the Books, teams had 30 seconds to huddle together to prepare an answer for each of the 16 questions. Eight points were awarded for the correct title and author and five points were awarded for correct title only. Principal Jeff Hendrickson applauded all Level 1 and Level 2 participants for their dedication and love of reading, while Library Media Specialist Jessica Somers thanked team coaches and parents for all of their support. Level 1 competitors Maxwell Scipione, Ryan McLoughlin and Andrew Mainville of “Eat Sleep Read” were awarded 96 points and a first place finish, while Hayden Ferraris, Shelby Merritt and Caitlin Scout of “Lighting Readers” were awarded 88 points and a second place finish. Both teams advanced to the district battle. 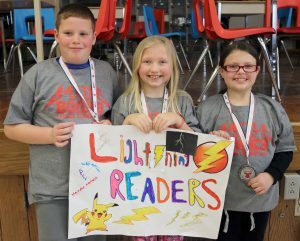 Each Battle of the Books competitor received a participation certificate and the top teams received T-shirts to wear at the district battle and medals.